CHICAGO — What do you do when a broken skull and a scheduling conflict throw a wrench in your dancemaking? Anna Rodimtseva and Karen Yatsko asked themselves this very question one year ago when less than ideal circumstances could have spelled the end of this concert. However, with a year to heal up and clear their schedules, these ambitious graduates regrouped and presented Just Another Recent Grad Show Feb. 1-2 at Hamlin Park Fieldhouse. Rodimtseva and Yatsko kicked off the evening with a funny and personable curtain speech informing the audience that they were the recent graduates of Columbia College Chicago responsible for the production, as well as the usual bathroom location, cell phones, intermission, etc. 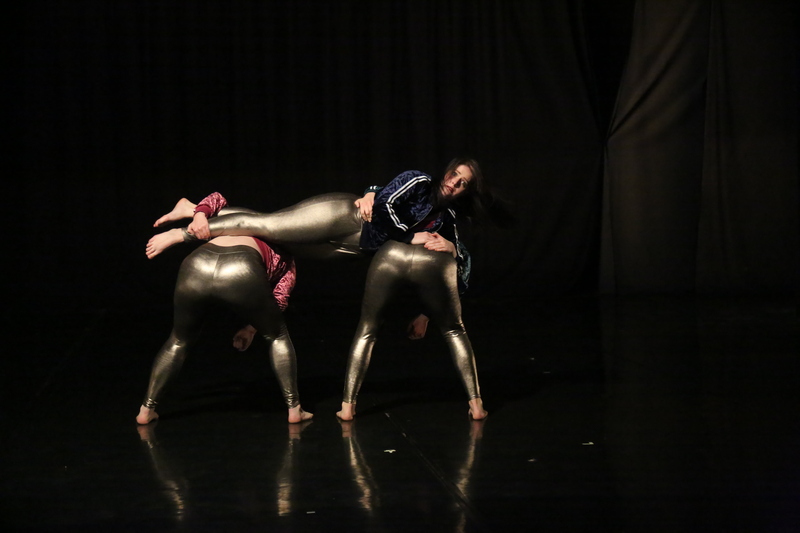 In keeping with a quote from their advertising – “It’s not deep, it’s cheap” – they set the tone for a relaxed evening of dance to show the community what they’ve been up to since graduation. In the opening piece, Rodimtseva’s Shalosh, five dancers, all women clad in white tank tops and deep scarlet wide-legged pants powerfully took the stage to present a 20-minute piece influenced by Rodimtseva’s travel in Israel. As the lights came up, the women appeared in profile to form a line from upstage to down. One by one they fell into a lunge, each striking a different gesture. From here the piece unfolded beautifully into a well-composed series of simultaneous duets and trios. Through gesture and movement, the dancers embodied an unapologetically feminine strength without resorting to a piece about feminism. This line can be difficult to toe, especially in this particular moment in our nation’s history, but Rodimtseva and her dancers did so with honesty and confidence. The piece was accompanied by a variety of smartly selected music flipping between traditional Israeli sounds to dreamy pop. The most powerful moment for me, and first major shift in composition, took place as three dancers turned downstage and stared directly at the audience as they slowly made their approach. They were eventually joined by the other two dancers to form a line of five in close proximity to, and facing the audience. This focal shift was accompanied by a sharp change in lighting from a general wash of light to harsh front lighting, creating an effect similar to that of a car’s headlights. The dancers simultaneously reached outside of themselves, as if grasping at something ethereal and just beyond their fingers. It was at this moment that the audience realized how connected Rodimtseva was to this work as she delivered a riveting and honest standout performance. That’s not to understate the ensemble of dancers who join her (April Butcher, Umi Nakamura, Karen Yatsko, and Nicole Flores or Anna Keller, depending on the night). They too are fully committed, excellently rehearsed, and capable of embodying the experience and choreography Rodimtseva demands of them from this work. The only thing I wished for was more interaction between the dancers. Each dancer flowed beautifully between an internal, self-reflective gaze, and an external one focused on something outside the physical realm of the piece, but the dancers rarely looked at one another or, with the exception of the line of five described above, the audience. 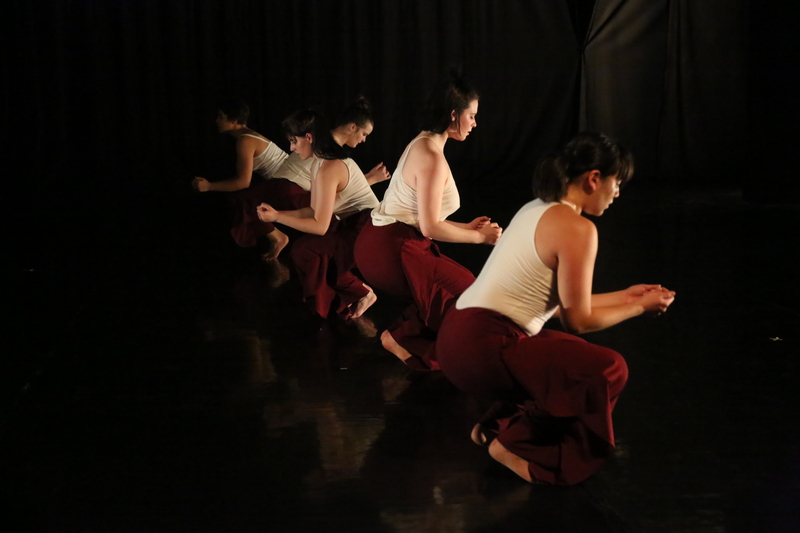 The few moments of interaction between the dancers were powerful and the piece could have held more of that connection. After a brief intermission, we were treated to A Pretentious Cheer by Karen Yatsko. Straight away, we knew we were in for something totally different. The first indication of this were the spectacular costumes; coordinating velour track jackets, metallic spandex leggings, and over-the-top ‘80s style hair and makeup. The piece began as Anna Keller somersaulted across the stage and was met by Andy Slavin, who jumped out from the wings, executed a frantic, clowning jump, and retreated. After three rounds of this, Rodimtseva ran on stage, let out a silent scream, which turned to a yawn and then ran upstage to land face first, where she remained for the first minute or so of the piece. Seventies and ‘80s dance tunes were bumping, the audience was laughing and the second act was off to a good start. Throughout the 20-minute piece, a garish-in-a-good-way, slapstick one-upmanship unfurled. Slavin and Keller appeared as some sort of dancing duo determined to steal the audience’s attention through mockingly overblown pelvic gyrations, suavely pointed fingers, and egotistical mugs to the audience. The whole piece had a Waiting for Guffman meets Flashdance vibe. Rodimtseva’s character was a little harder to define. At times, she appeared a fully integrated member of the ensemble, but she was often intentionally upstaged and left to her own desperate devices to gain the spotlight. At other times, she simply watched the action on stage take place. I think the entire piece was intended to be humorous, but I couldn’t decipher how much of the piece was supposed to be funny and how much was a commentary on performers and pretention. A joke that did land was an exchange between Slavin and Keller who stood face-to-face center stage with Rodimtseva sitting on the floor in front of them. Slavin removed Keller’s jacket and she slid into a low lunge in front of Slavin, and then retrograded the lunge and began to zip up her jacket. Slavin reached for the zipper, and Keller slaped their hand away. This particular moment stood out to me because of its unexaggerated quality. So much of the humor in this piece was derived from a clownish, overblown style of movement, and while this was funny for a few gags, it lost its effect with time and I’m not sure that choreographing the entire piece in this style served the work. I give Yatsko a lot of credit for taking on the challenge of choreographing a humorous work – it’s not an easy task. If she can clarify and solidify the moments of humor and performance commentary, this piece could become something really unique. Producing a dance concert is an enormous undertaking, and Rodimtseva and Yatsko more than pulled it off. Over the last year, these recent grads cleared their fair share of hurdles culminating in an evening that ran quite smoothly and showcased strong, captivating dances. Want to leave a Venmo tip for the writer to show how much you love their content? Please type in the amount (without the dollar sign) and indicate the author’s name in the description to make sure your gratuity goes directly to them.